How do I set up a subscription product? When do subscriptions get charged each month? How does a subscriber cancel their subscription? 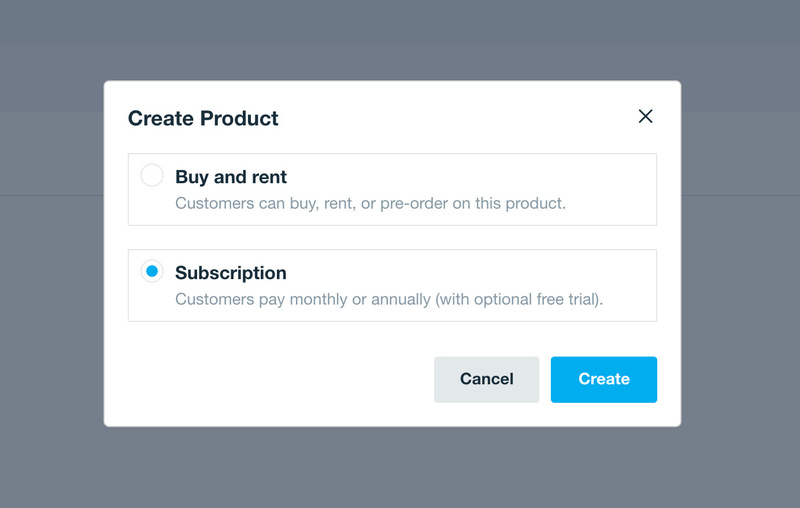 Subscriptions on Vimeo OTT let you charge your customers on a recurring monthly and/or yearly basis for streaming-only access to your content. You can add new work as often as you want! You control the branding, packaging, and pricing. Learn more! Vimeo OTT's subscription fees are simple: $1 per subscriber per month + merchant fees. More on pricing. 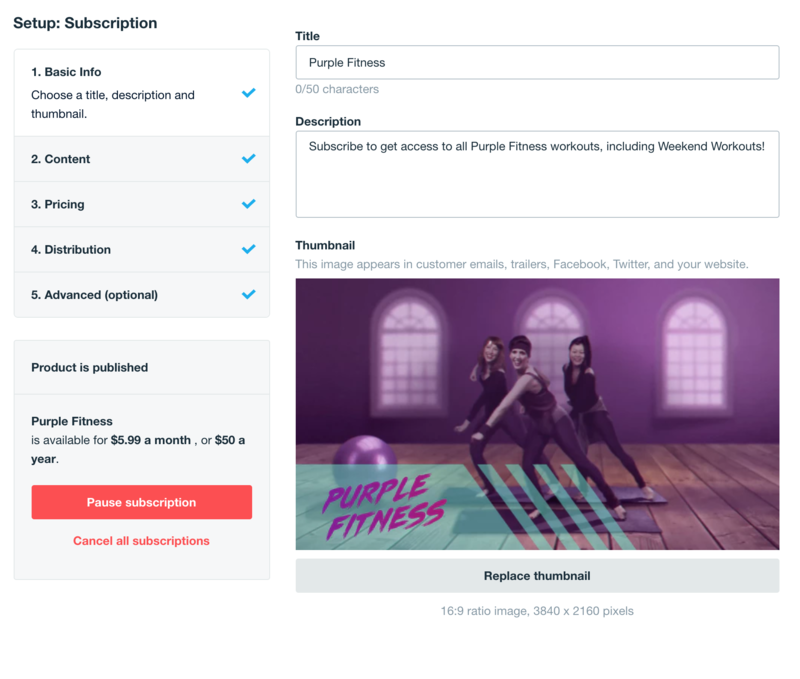 How do I set up a subscription product on Vimeo OTT? Head to the Products page of the Vimeo OTT Admin. TITLE - Set a name for the Subscription. DESCRIPTION - Describe what your subscription is! This will be shown on the checkout form. THUMBNAIL - provide a 16:9 ratio image (3840 x 2160 pixels works best) to represent your Subscription. TRAILER - this is a video that represents your Subscription. You may upload a new video here or choose a previously uploaded video. Click "Choose Trailer" to see a list of your uploaded videos that you may select to use as your Subscription trailer. Free-trials - Want to give subscribers a free trial to watch your content before they are charged? Set it for 3, 7, 14, or 30 days! Or, don't. You will not be charged the $1 price for a subscriber in a free-trial. You will be charged once the customer is in the paying part of the plan. A $1 holding charge will be processed on the customer's card. These transactions will be reversed immediately and should disappear from accounts within 24 hours. The reason for this charge is to help prevent fraud. In the Distribution section, you can choose whether your videos are available worldwide, only in certain countries, or blocked in certain countries. And finally, in Advanced settings, you can customize the messaging we send when a customer makes a purchase. This is optional, but it is nice to include a custom email greeting, ie: a filmmaker's personal message that gets sent to all who purchase this Product. Make sure you click Save when you're done! Movie - A Movie Collection is for a feature film with optional supporting content. Series - A Series Collection is for just that - a series, with seasons and episodes. You can sort by seasons within a Series. Playlist - A Playlist is a group of videos ordered for consecutive playback.Once you have done those things, hit the Save Product button. Congrats! Your subscription is now for sale. 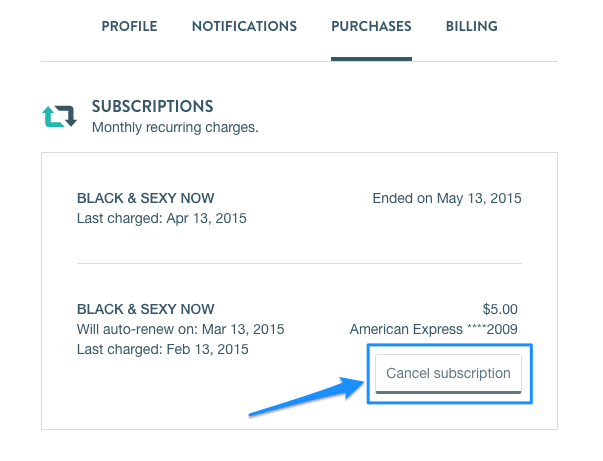 Subscriptions get charged on the same day each month/year that the user has subscribed. So, if they first subscribed on March 15th, they would next be charged on April 15th. They can cancel at anytime on their purchases settings page at http://vhx.tv/settings/purchases. When they cancel, they will have access to the content until their next billing cycle day.